​The history of Dealers Supply Co. begins shortly after the turn of the 20th century when a Nebraskan farming family decided to seek greater opportunity and prosperity in the still relatively undeveloped West. They eventually settled in the Portland, Oregon area. In the year 1920, Austin Francis and his three sons George, John, and Carroll founded “Francis Brothers Feed and Seed”. Their intent was to make a living supplying Portland farmers with feed, seed, and farm supplies; something they knew a lot about since the family had been farmers for generations. Due to their success in selling farm supplies, what started as three stores eventually grew to five. To better service their customers, the Francis brothers decided to purchase their primary feed and seed supplier, bringing “Dealers Supply” into existence in 1927. The supply warehouse was located at the corner of SE Alder St and 2nd Ave. Over time, Dealers Supply purchased surrounding properties in order to expand their warehouse capacity. In 1976, the office was relocated to the other side of the block at 110 SE Washington Street, where the company remained until 2013. Regardless of the address, Dealers Supply operated continuously from the same location in Southeast Portland for 86 years as the city grew and changed around it. The founding Francis brothers always listened and responded to their customers’ needs. As a result, they found themselves selling a lot of building materials, especially roofing. Although the company has sold roofing for most of its existence, the transition from farm supply to building materials was gradual. Dealers Supply has grown to become the premier source for roofing, waterproofing, weather barriers, insulation, and related building materials in the region, stocking the highest quality lines and most extensive range and volume of products in the industry. The product offerings may have changed with time, but Dealers Supply’s primary philosophy has not. The company strives to have the best products and services its customers demand at a fair price and at all times. As one of the founders, Carroll Francis, often said “it’s hard to sell from an empty wagon”. Serving the needs of its customers also led Dealers Supply to innovate and help revolutionize the industry it operates in. Don Francis, third generation owner, was inspired by farmers using gas powered Clearfield conveyors to stack hay bales. He decided to put similar technology into service to preform rooftop delivery of materials by mounting custom made conveyors on flatbed trucks. In the mid-sixties, Dealers Supply pioneered this vast improvement in material handling and delivery. This service has since become the standard in the industry. To this day Dealers Supply maintains the most advanced fleet of vehicles and equipment in order to constantly improve upon the efficient and timely jobsite delivery of building materials. Dealers Supply has always been a knowledgebase and resource for its clientele and the industry it services. What initially began as helping farmers produce better crops and grow healthier livestock has transformed into assisting contractors find the right solutions for their construction projects. A knowledgeable, experienced, and professional staff is the cornerstone to Dealers Supply being a resource for its customers. The company continually invests in its staff in order to provide the best possible service and experience for the customers it serves. In 2013, Dealers Supply made a huge commitment to the building industry in the region by relocating its operations to property it had recently purchased and developed. 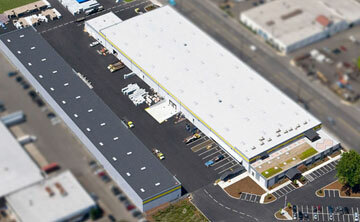 The new location is the largest and most modern warehouse and distribution facility servicing the roofing and construction industry in the nation. The company had simply outgrown its prior home of the previous eight decades and the need to relocate was sorely needed. From its new headquarters, Dealers Supply is better able to service the industry and respond to customers’ needs more completely and efficiently. This new location also allows the company to continue to grow, keep its core values alive, and accomplish its ongoing mission of being an indispensable component of the building industry in the region and beyond. You can now find Dealers Supply at is central and conveniently located facility in the heart of Portland at 2345 NW Nicolai Street. From its inception to this day, Dealers Supply has been a local and family owned company. The fourth and fifth generation of Francises continue to operate the only independent roofing distributor in the region. “A Uniform Standard of High Quality and Service” is the motto created in the beginning, and still the motto we live by today.